The Arab Music Archiving and Research foundation (AMAR), in collaboration with the Sharjah Art Foundation (SAF), presents “Min al-Tārīkh”. Welcome to a new episode of “Min al-Tārīkh”. In today’s episode, Prof. Frédéric Lagrange will be telling us about Sheikh Abū al-‘Ilā Muḥammad. The very little information we have on Sheikh Abū al-‘Ilā Muḥammad is not confirmed. Only a couple of Syrian sources –Adham al-Jundī’s book published in the late 1950’s or early 1960’s in Aleppo; and the book by Aḥmad al-Jundī (probably Adham al-Jundī’s son) published in 1986– talked about him. The point is that our only other sources will obviously be the records themselves accompanied by our thorough listening and precise analysis. According to these sources, Sheikh Abū al-‘Ilā Muḥammad was born around 1878 and died on the 5th of January 1927. The information about his place of birth is not confirmed. It may have been Banī ‘Uday village in Asyūṭ, a village famous for its savants, and Sheikh Abū al-‘Ilā may be the grandson of famous Sheikh Al-‘Adawī, i.e. the great ṣūfī Sheikh Ḥasan al-‘Adawī who died in 1886 and used to defend ‘Urābī Bāshā. 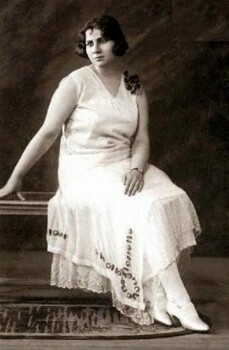 Abu al-‘Ilā may also be the grandson of Prince Ḥasan Katkhudā on his mother’s side of the family. We do know that he settled in Cairo in the late the 19th century or early 20th. He joined the Azhar, worked in the Sūq Misq neighbourhood, and became a chanter and a reciter, the latter being a little questionable because of the numerous mistakes in syntax/grammar, language, as well as melody in his recordings. Hence, we have doubts about him being an early 20th century Azhar graduate. Compare him to someone like Ṭah Ḥusayn who did not even reach the mashāyikh rank as you well know, and you will note the great difference between them. Him saying “Ufdīh in ḥafiẓa al-hawa aw ḍayya‘ah” should be enough to prove this point. True. As a reciter, even if he had not studied naḥū (Arabic grammar)… well, his mistakes are quite significant, like “ufdīh” for example. The point is that Sheikh Abū al-‘Ilā Muḥammad used to perform in weddings and private parties, singing ṣūfī as well as mundane qaṣīda. Even though many ṣūfīqaṣīda can be interpreted as mundane qaṣīda, they are mostly about the love in God, and are very difficult to categorize as ṣūfīqaṣīda or mundane qaṣīda –i.e. ordinary love poems– just upon listening to them. This categorization can only be made when we know who the author is. For example, when we know that the author of a qaṣīda is Ibn al-Fāriḍ or Al-Bahā’ Zuhayr, we automatically categorize it as a ṣūfīqaṣīda, even though the lyrics can be interpreted as ordinary mundane love words, in most cases at least. The point is that Sheikh Abū al-‘Ilā Muḥammad, as I said earlier, performed in private parties, singing dawr and qaṣīda. He was greatly influenced by ‘Abduh al-Ḥāmūlī and sang some of the latter’s great dawr but did not record many of those. 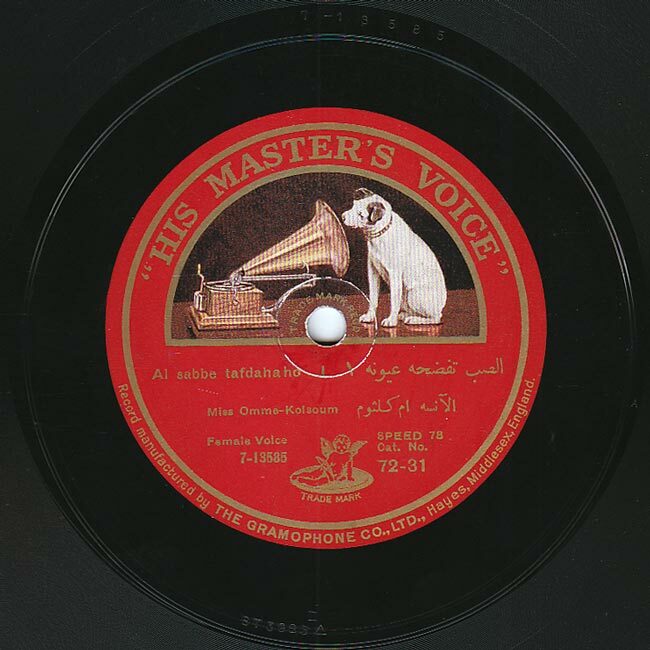 Between 1912 and 1914, Gramophone made his first recordings, followed by other record companies. He specialized in mundane singing, accompanied by a takht including the best instrumentalists such as Sāmī al-Shawwā. In his book, Aḥmad al-Jundī wrote “Sāmī al-Shawwā said that Sheikh Abū al-‘Ilā Muḥammad never repeated the same piece in the same way, i.e. that he only used to tell the instrumentalists to play a dūlāb to a certain maqām, and improvised. In my opinion, this is debatable. It may work with “Wa-ḥaqqika ant” but not with “Ghērī ‘ala el-silwān”, for example. … that we do not hear in Gramophone’s recording. Yet the melodic pattern is exactly the same. Sheikh Abū al-‘Ilā Muḥammad may have had two different types of qaṣīda: the fully improvised one where he displayed his skill in improvising a solidly built and convincing melody such as in Meshian’s famous recording of “Wa-ḥaqqika ant al-muna w-al-ṭalab” to the bayyātī, that is intrinsically different from the famous recording to the sīkāh. Actually, both recordings are famous. So, which recording will we listen to? Meshian’s or Baidaphon’s? Let us listen to both and compare them. By the way, we also know that Sheikh Abū al-‘Ilā Muḥammad mentored Umm Kulthūm at the beginning of her career. It is also said that he is among those who discovered her in her village –not in Ṭamāy al-Zahāyira of course, but in Simbalawēn”. He heard her sing in Simbalawēn and convinced her to settle in Cairo. She was actually his student and recorded many of his qaṣīda. According to the legend, the same day Aḥmad Rāmī returned to Egypt coming back from France, he heard Umm Kulthūm singing one of his qaṣīda in the Azbakiyya garden. Of course, I do not believe such a coincidence took place. I doubt he heard Umm Kulthūm sing the exact same day he returned from Paris. The same day he returned from France… he travelled for a few hours from his house to the Azbakiyya garden after a return boat trip that had lasted a few days… hmm… I have my doubts. Exactly. Moreover, Umm Kulthūm was, by some coincidence, singing one of his qaṣīda… I have my doubts too. Give it at least a week. One or two weeks, or a month… it does not matter. The point is that Aḥmad Rāmī heard Umm Kulthūm sing qaṣīda “Al-ṣabb tafḍaḥuhu ‘uyūnuhu” composed by Sheikh Abū al-‘Ilā Muḥammad. I think we should listen to both versions: Abū al-‘Ilā Muḥammad’s and a short excerpt of Umm Kulthūm’s. 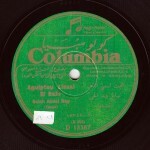 Her recording of “Al-ṣabb tafḍaḥuhu ‘uyūnuhu” was made on an electrical-power printed record around 1927-1928. Actually, she neglected this piece for a long time and only sang it again during WW2 in the 1940’s at a Lycée Français concert. 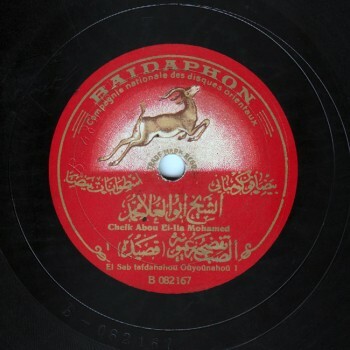 What upsets me the most is that we have acceptable quality recordings of Umm Kulthūm made during the 1930’s, but that this rare recording, this exception, of the only time Umm Kulthūm sang a piece composed by Sheikh Abū al-‘Ilā Muḥammad in the 1940’s is lost forever. We will never know how these qaṣīda were sung in public performances. We will never know the extent of the difference between these 78rpm records and the recording of a performer singing exactly like Abū al-‘Ilā Muḥammad… how she ornamented the piece, the personal variations she added to this initially magnificent melody. Moreover, this concert was given in the 1940’s, i.e. at the peak of Umm Kulthūm’s maturity. It was not recorded at all, was it? If it was, then the recording is missing. If it existed, we would have known. 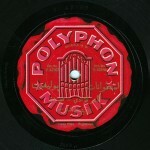 This is year 2013: Finding a lost recording made in a 1950’s concert may happen, but a very rare recording made in the 1930’s will never reappear. It is lost forever. Dear listeners, we have reached the end of today’s episode. We will resume our discussion about Sheikh Abū al-‘Ilā Muḥammad in our future episode of “Min al-Tārīkh”. We thank Prof. Frédéric Lagrange. “Min al-Tārīkh” was brought to you by Mustafa Said.